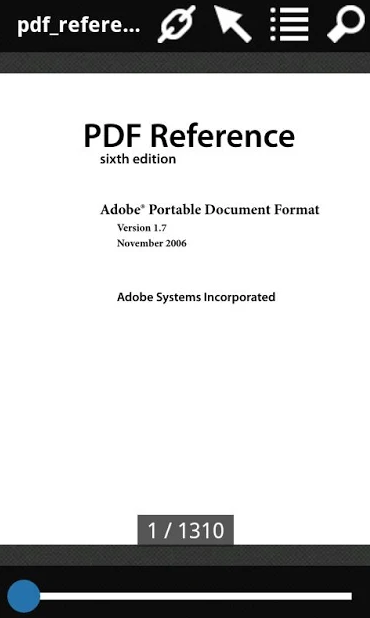 PDF was built by Adobe to be a portable format that was easy to create and carry around. Smartphones were also created to be mobile and easy to carry around. What better way to read PDF books and documents than on your Android smartphone? For this, you will need a PDF reader app for Android smartphone or tablet. So what are we looking for in PDF readers? It should be able to handle small and large PDF files and eBooks with ease. But that’s not all. There are other essential features like bookmarking, sharing, highlighting, commenting, annotating, and sometimes, filling forms and signing documents too. Let’s take a look at some of the best PDF reader apps available on the Android platform and see how they differ from each other. Adobe pioneered the PDF format and is largely considered to be the default authority with anything that has to do with PDF files. Acrobat Reader is a free Android app that is as robust as it gets. Acrobat Reader will let you import PDF files from a number of sources like local storage, cloud storage, and eMails. You can annotate PDF docs, comment on specific sections, highlight or bookmark paragraphs/pages that you like, and also fill in and sign forms. It also handles printing PDF files. Adobe Acrobat is one of the most complete PDF reader apps for Android. The app comes with in-app purchases but no ads. It is free to use but you will have to subscribe for advanced features like full-text editing, Adobe cloud storage, and more. 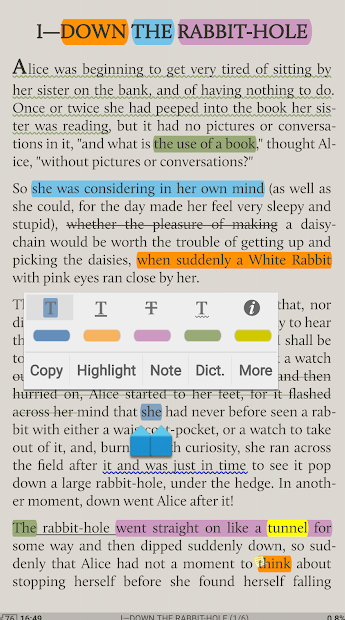 Foxit Mobile PDF is not just a PDF reader but also an editor. It is also one of the most popular alternatives to Adobe’s Acrobat Reader. Foxit Dev team came up with the idea of cPDFs which stands for connected PDFs. This provides a collaborative environment for users to create, edit, share, comment, and annotate in a friendly atmosphere. Like Adobe, this free PDF reader for Android supports cloud storage, scan to convert, signing and filling forms, annotation, and even playing audio and video files linked within PDF files. Advanced options, with subscription, converting documents, editing them, and collaborating on them. Xodo PDF Reader is what I am using personally on my Android smartphone. Where Adobe offers a professional looking UI and Foxit takes a rather bland approach, Xodo PDF Reader looks good and functions smooth. Annotation involves more colors and shapes (think circles, squares, arrows, and so on) when compared to the competition. One of the features is a tab-like format where you can open more than one PDF file on a tablet at once. Much like modern day browsers. This is more suitable for tablets with wider screens but works on smartphones too. Other features include filling forms, signing docs, and support for cloud storage sites. 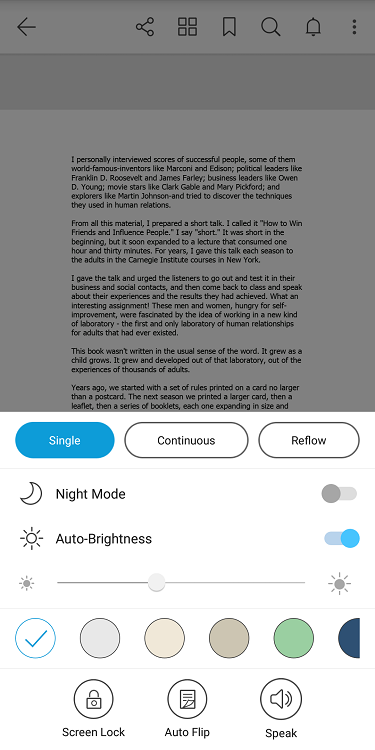 Two other features which not every PDF viewer app comes with are night mode and sleep mode for those who like to read before going to bed. Advanced features include converting images and collaborating with others. Xodo PDF Reader is a free Android PDF reader and there are no ads whatsoever. Makes it even more awesome. eBook Droid took a leaf out of Apple’s iBooks and create a virtual, dusty, and full of webs bookshelf. Looks cool. It comes with support for a number of book formats like PDF, WPS, DjVU, FB2, CBR, MOBI, RTF, and more. More suitable for avid readers who like download and reading content like books, comics, etc. 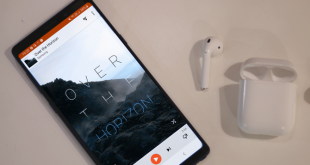 More suitable for book lovers rather than business users or productivity enthusiats, eBook Droid is the best PDF reader for Android if you want to customize your book reading experience. 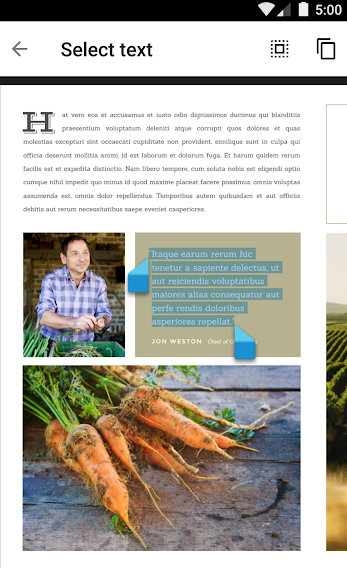 You can cut or crop margins, change layout and zoom in, automatic bookmarking, and fun annotation tools. You can use continuous flow, two-column or one column layout based on your reading preferences. eBook Droid is a free PDF reader with no ads or in-app purchases. ezPDF Reader is one of the oldest PDF reader apps on the Play Store. While the competition has increased since its heydays, ezPDF Reader still made the list because there is also support for some additional formats like EPUB along with PDF files. You can play audio and video files plus there you can also view GIF files. ezPDF Reader’s support for multiple file formats is only matched by its PDF file features like annotation, highlighting, commenting, filling forms and signing, and image editing. 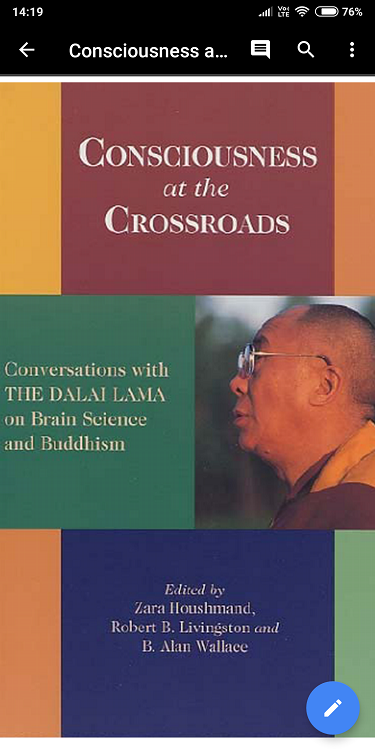 There are plenty of viewing options available to satisfy most of your reading habits. ezPDF Reader will cost you $3.49 although there is a trial version that you can try before you buy. Launching a PDF viewer app for Google makes a lot of sense. Google Drive is a popular cloud storage platform which is used by millions across the web to store all sorts of files and data including PDFs. As such, a PDF viewer that works directly out of Drive, allowing you to quickly view PDF files makes a lot of sense. On the flipside, Google PDF Viewer only works when you open a PDF file saved or shared from Drive. There is no app or any way to launch the app to view PDF files but you will see an option in other apps. A bit limiting but that doesn’t mean the app is not popular. Google PDF Viewer is a free app with no ads and will offer basic features like viewing, bookmarking, search, zoom, and that’s it. 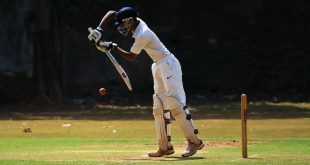 No annotation or form filling. A bare-bones approach that makes the app fast and light. 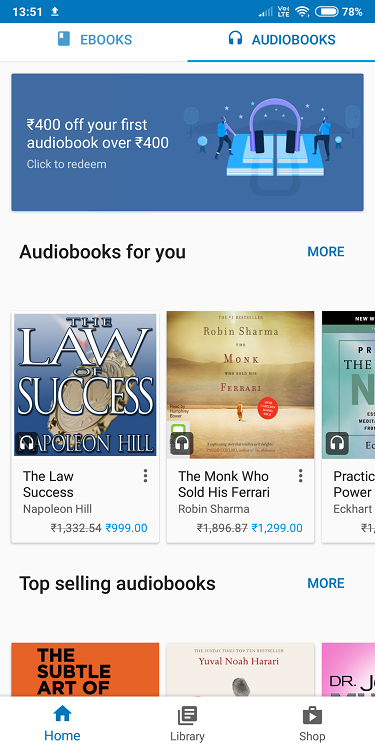 Another PDF reader from the house of Google but this time, it is an entire marketplace. Play Books is Google’s answer to Amazon’s Kindle reader which is the market leader right now. 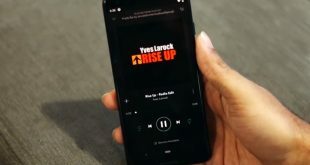 Play Books will not only let you buy eBooks and audiobooks, but also let you upload your personal collection in the cloud for free. You can now carry your favorite and read them wherever you want. You can read, search, highlight, take notes, share, and toggle the night mode on when you are reading the Winds of Winter in the bed. Play Books also supports a number of other formats like comic books, MOBI, EPUB, and so on. No ads or subscription model, but the app still lacks several features we saw earlier above. Play Books main selling point is the marketplace and unlimited free PDF uploads it allows. Looking for a beautiful PDF reader with the looks to die for? Download and install Moon+Reader for viewing PDF files. I like the ability to change pages with the volume button or camera! 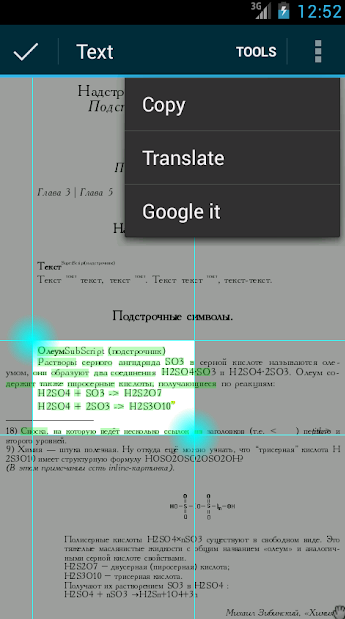 There is also support for annotation, highlighting, and a built-in dictionary with language support. Like some other apps we discussed above, Moon+ Reader supports a number of formats like EPUB, MOBI, CBR, CBZ, and many more. Moon+ Reader really lets you customize your reading experience multiple options for screen viewing and orientation (5 scrolling modes), text alignment and placement, and a functional bookshelf with details like author names, tags, and categories. If you are looking for something flexible and customizable, Moon+ Reader is the best PDF reader for Android in its category. The pro version will remove ads, allow text-to-speech function, more themes, Bluetooth control, advanced annotations and sharing support. A generic name for an app so common, PDF Reader is a versatile PDF reader app that you can download on the Play Store. 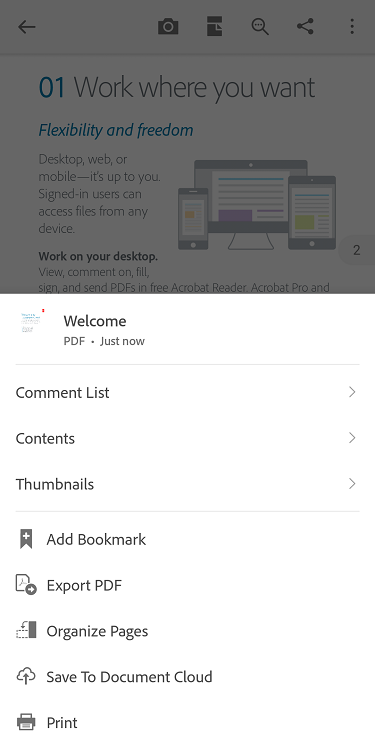 PDF Reader made the list because unlike its name, the app will also allow you to edit and write inside PDF documents with ease. 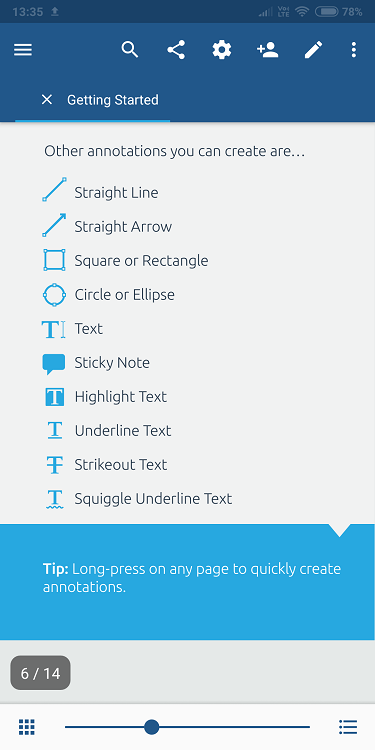 Annotating PDF files is fun with lots of shapes, sizes, and color options to choose from. You can draw on pages or convert PDF file to text file on the fly. 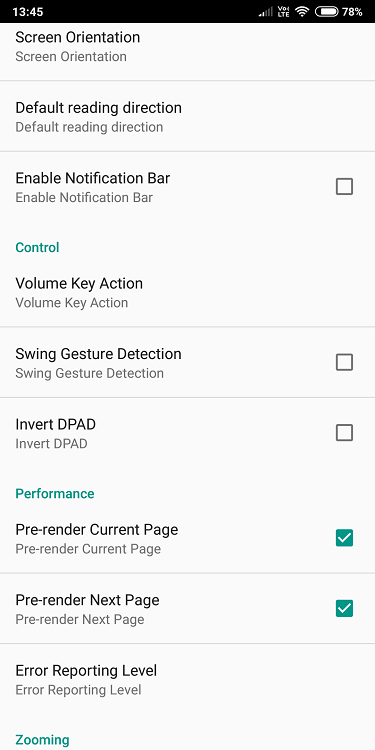 There is support for multi-finger gesture for easy scrolling and editing at the same time. No support for other file types but has a simple UI with a functional layout. PDF Reader is ad-supported which can be removed with an in-app purchase. The list of PDF reader apps for Android cannot be complete without an open source entry. muPDF is an open source PDF reader app that is free of ads and will never steal your data. For such a light-weight app, muPDF supports a number of formats including PDF, EPUB, and CBZ. It was designed to be a modular app meaning if you are nursing a developer in you, then you can add features to muPDF yourself. It does lack advanced features like form filling and signing, editing, and annotations but not all of us are looking for them anyway. There are quite a few PDF reader apps available on the Play Store and which you choose will depend on your needs and requirements. If you are integrated deep within the Adobe ecosystem, you know you need Acrobat Reader. Looking for something as robust the Adobe but cheaper, Foxit got your back. Looking for a free alternative with similar features, Xodo is also ad-free. If you also like to read comic books and want something that can handle pretty much anything you throw at it, Moon+ Reader and eBook Droid will help you out. So, which one are you using and why?